I've been looking at Clojure for the past 18 months. I prefer learning and practicing by writing a failing test first, but unfortunately, the feedback loop through TDD in Clojure is slow. How slow? Well, it's between 4-10 seconds depending on the size of the project. I am still new to the language, I want to tweak my code a tiny bit and see if that change broke my tests. I am used to Ruby's almost immediate test execution, and the long wait for running the tests in Clojure makes it less effective. In Ruby Land, I am used to running a large number of tests (958 examples in our application) in about 3.8 seconds. 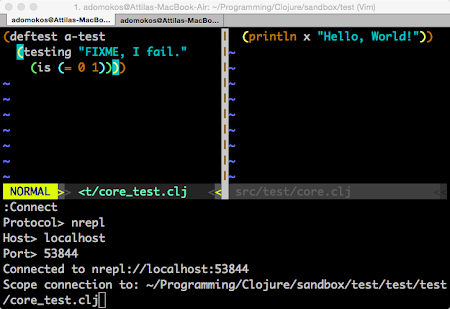 In a brand new Clojure project, it takes about 4 seconds to run the only failing test. This is no surprise: Clojure code has to be be compiled to Java byte code, where the compilation takes time. 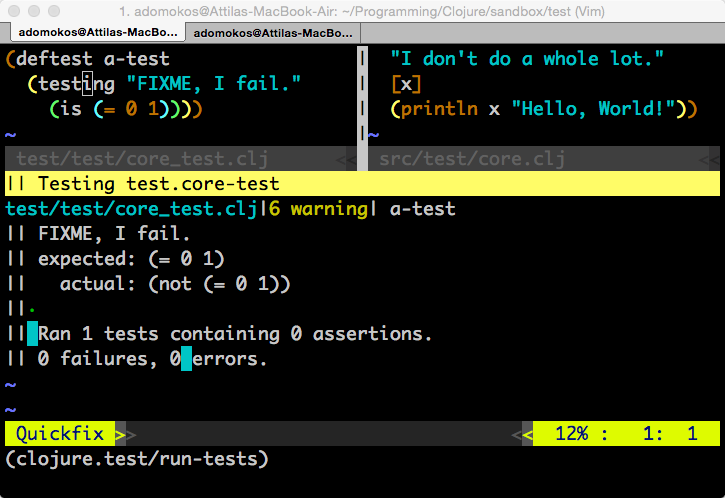 I bumped into Ben Orenstein's great "Tips for Clojure Beginners" blog post a few weeks ago. It's a must read if you're new to Clojure. Vim is my preferred editor, and he wrote about a vim plugin by Tim Pope, called fireplace.vim. I remember looking at it briefly, but for some reason, I did not give it a try at that time. A few days later I hacked on some code in Clojure again, and it reached a point where I threw my hands in the air and declared: "enough is enough!" I caught myself checking out Twitter and other websites as I had to wait about 10 seconds to run the tests after a simple change. 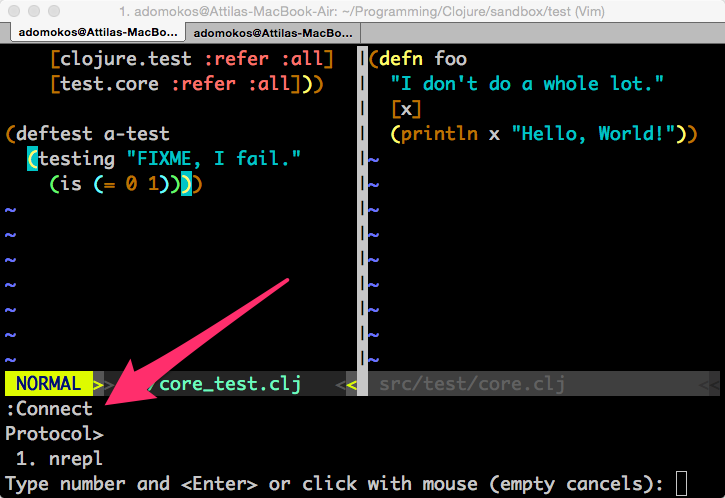 I went through this blog post, where the author talks about using fireplace.vim for test execution. I gave it a try, and there is no turning back! I installed fireplace.vim with pathogen. 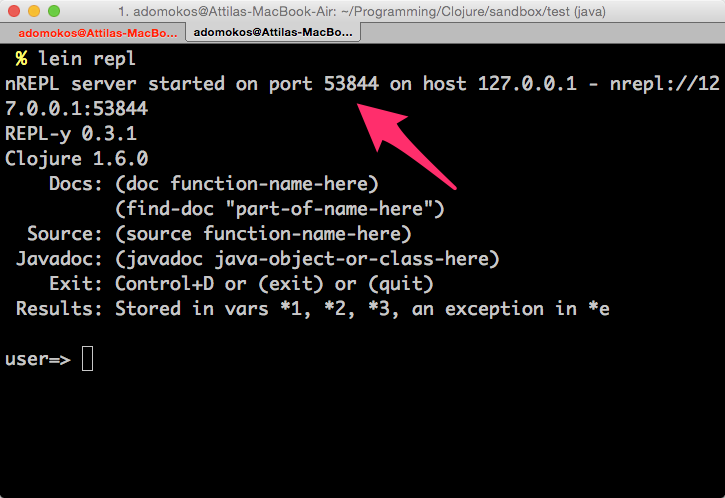 I opened another tab in my terminal, navigated to the root directory of my Clojure project. Fired up lein repl there and noted what the port number was. 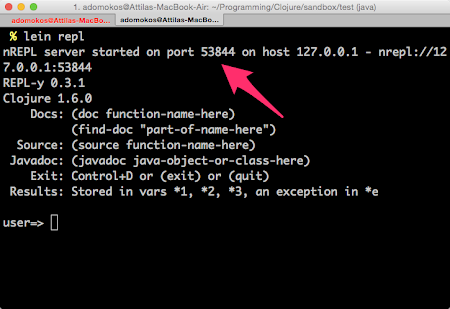 In this case, 53844 was the port number for the nREPL server. I connected to that from my vim session in the other terminal tab by typing the vim command :Connect. Fireplace gently investigated which nREPL server I wanted to connect to. I chose (the obvious) option one, it used localhost and I had to provide the port number from the other tab, which was 53844. I made the test pass, the output was terse. I guess there isn't much to say when all my expectations are passing. I included an animated gif here to show you what it feels like running the tests. Super sweet, don't you think!? 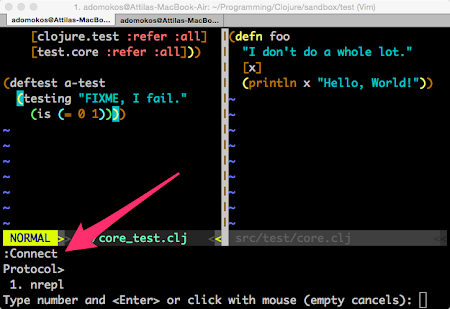 When I change a Clojure file in a different buffer (other than the buffer where my tests are), I need to Require! those files again. I get around this by writing all my functions right above the tests in the same buffer, and moving them to their final place when I feel confident about them. There is an easier way to connect to a REPL by using fireplace.vim's :Piggieback! command. Please read the docs of this great vim plugin, that's how you can learn all the other features (like macroexpand) I have not described in this blog post. :nmap ,r :RunTests<CR>. With this change, I had the same joy in Clojure as I've had with Ruby and RSpec for years. Bye-bye checking out while I am test driving my code in Clojure! I've been using this keybinding with fireplace in vim recently: :nmap ,r :Require! 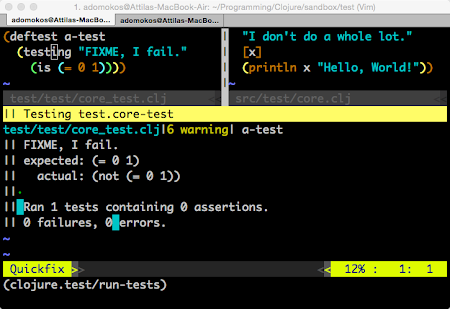 <bar> Eval (clojure.test/run-tests)<CR>. It picks up any changes I make in the source and the test files as I require packages before every test run. I'd recommend giving this a try.